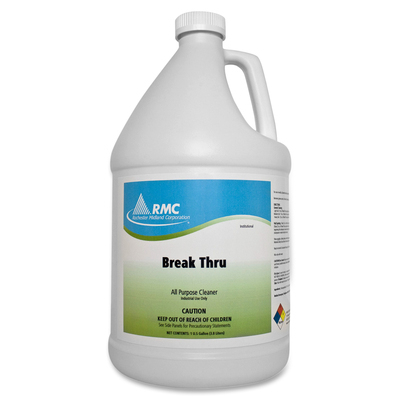 Break-Thru All-Purpose Cleaner/Degreaser Is Highly Concentrated And Works Great On Grease Spot, Pencil Marks, Lipstick, Oil Stains, Ink On Walls, Painted Surfaces, Vinyl Upholstery, Desktops, Carpet, Laundry And Any Washable Surface. Nonabrasive Cleaner Also Works Great As A Carpet Spotter With A Sponge Or Auto Scrubber. Dilution Ratio For Light Soil Is 8 Oz. Per Gallon Of Water. For Medium Soil, The Dilution Ratio Is 16 Oz. Per Gallon Of Water. Use 24 Oz. For Heavy Soils..
Break-Thru All-Purpose Cleaner/Degreaser Is Highly Concentrated And Works Great On Grease Spot, Pencil Marks, Lipstick, Oil Stains, Ink On Walls, Painted Surfaces, Vinyl Upholstery, Desktops, Carpet, Laundry And Any Washable Surface. Nonabrasive Cleaner Also Works Great As A Carpet Spotter With A Sponge Or Auto Scrubber. Dilution Ratio For Light Soil Is 8 Oz. Per Gallon Of Water. For Medium Soil, The Dilution Ratio Is 16 Oz. Per Gallon Of Water. Use 24 Oz. For Heavy Soils.